Andy recently contacted United Cerebral Palsy (UCP) and they asked him if there was anything we needed. Andy thought about it and said, "Well, we do have a walker on loan from Early Intervention, but it's actually too big for him." The woman Andy talked to told him she would try to find a walker we could use. A few weeks later and we have a Gait Trainer in our house called a Gator. It's awesome and Elijah loves it. When Andy picked up the Gator he asked how long we could have it. "Can we keep it until he grows out of it?" he asked. The lady said it was ours to keep. Talk about a blessing! I don't know how much a walker such as this one costs exactly, but it would be quite expensive to purchase. We will, of course, be donating it back so someone else will be able to use it. We don't doubt that Elijah will be able to walk independently, but our OT and PT thought this walker would be nice even after he is able to walk because long distances might be difficult for him. Our OT mentioned how nice this walker is – she said, "It's like a Cadillac when all Elijah needs is a Volkswagen." It's nice and we're happy to have it! We sure are blessed! Here is a video of Elijah in action. Look how happy the little guy is. I think he's saying, "Finally! I can run!" So what did the boy of wonder do today? This morning Elijah's OT came by for her weekly visit. Elijah was sitting perched on my knee and he decided to stand up – on his own. He took a few steps forward, stopped to catch his balance, and then took some more steps. In total, we figured he took about 8 or 9 steps completely independently! How amazing is that? Elijah is officially weaned and has been for about a week now. We made it to seventeen months and I feel really good about that. The cool thing is that Elijah completely self-weaned; I had nothing to do with it. I suppose as far as quitting something that has been a part of your life for seventeen months (or in Elijah's case his whole life!) it couldn't have gone any better. He simply didn't want to do it anymore and I couldn't force him to do it. It was a gradual process and painless for both of us - well, except for that moment last weekend when I saw Elijah's boppy pillow and got all teary-eyed because I knew our nursing days were over. Believe me, I was ready to be done with it too, but it's simply another reminder that our little boy is growing up. If I'm going to be honest, I'd have to admit that I'm really glad it's over. Don't get me wrong. I know it was a blessing to be able to do it and I haven't forgotten how hard we fought to get it started in the first place. But now that we're finished with nursing, I get to do some of the things I've given up for the past 2+ years. A bit selfish, I know, but it sure was nice to have an amaretto sour this past weekend. And, I've been really enjoying eating cheese again. I haven't had dairy for six months and I love cheese. Let's just say that I'm a happier person and I think Elijah is too. Here's the other cool thing – self-weaning seems to be a good sign of Elijah's cognitive development. From what I understand a lot kids self-wean around his age if they haven't been weaned already (not that nursing for longer is a bad thing cognitively). To me, though, it just shows that he thinks he's too busy to bother with nursing, which is actually a good thing. He's letting us know what he wants and needs, which is definitely great. I learned something from Andy's late grandpa Lester. Whether he was receiving a plate of food or opening a gift, Lester always responded with the phrase, "Thank you! Thank you! Thank you!" It was as if one thank you wasn't enough and he wanted to make sure we knew how grateful he really was. One thank you would surely not be enough to express our gratitude for all of the donations Elijah has received in the form of prayers and money. It is our firm belief that it is from all of your prayers that Elijah is doing so well. And, now we want to also thank you for the monetary donations we've received to fund Elijah's alternative therapies. I'm sure Elijah has received money from complete strangers, friends of friends, and some who've never met us but read about Elijah on the web. I am completely humbled that so many would dig in their pockets, especially as we hear constantly about the bad economy, and give to help Elijah thrive. I've honestly been writing this update in my head multiple times as I don't know how to fully express our gratitude. I have gotten teary-eyed multiple times when I have heard that we've received another donation for Elijah. What a blessing! It's a humbling experience to ask others for money and I have been overcome with how many people have opened up their hearts (and also their wallets) to help Elijah. It's amazing and what else can we say other than, "Thank you! Thank you! Thank you!" We feel humbled, thankful, grateful, and blessed. Elijah will be having a fundraiser in Menomonie, WI on February 22nd (more details to come). The Chippewa Valley chapter of Thrivent Financial is providing matching funds for that event, so if you've donated money up to this point it will get lumped in that fundraiser and will qualify for the matching funds. Isn't that great?! They're matching 50% (up to $10,000) - which means that we could potentially make up to $5,000! (If you'd like your donation to be included in the matching funds, please donate by early February or come to the fundraiser on the 22nd). I think it's safe to say that Elijah has taken his first steps! Lately Elijah has been working so much on balancing. He's been enjoying standing, sometimes even more so than walking! This morning, I tried to set him on the floor, but he wanted to stand - so I put him on his feet and let go. He stood for a few seconds, balancing himself and then – took steps! He's done this before, but this morning was the longest I've seen him able to stand without falling. I know it's going to be awhile before he's walking around the house, but it's still amazing. Literally every week he makes improvements. He's a miracle in progress! Thank you! Thank you! Thank you! You know how we've said that HBOT isn't covered by insurance? Well, it isn't covered for cerebral palsy, but we found out that it is covered for cerebral edema - which Elijah had after he was born. Long story short, we were able to resubmit a claim with a different code and it looks like his treatments are going to be partially covered!!! This is huge and I'd encourage any of the few fellow "special needs" parents out there who read this blog to check your child's medical records and check your insurance – there just may be a way to get HBOT covered. Someday I hope that this important therapy will be covered by insurance for all of those who need it. (As a side note – I hope you all know that your donations are still as important as there is still much we need to cover out of pocket. There are other therapies we'd like to try and every cent will be used towards therapy for Elijah). Elijah and I are getting ready for our adventure in March. We're heading back to Madison, WI for our second round of hyperbaric treatments. Andy won't be able to join us this time, so we're sad that we won't be able to see him every night. It'll be difficult to away from the daddy of our little family, but we know that this is so important for Elijah's growth and healing. We'll also be doing intensive therapy (PT, OT, speech) while we are there. This trip has been made possible by all of you, so again I say: Thank you! Thank you! Thank you! PS. Please know that although I say "I", Andy feels the same way as I do and is also so thankful for all of the support. PPS. Keep those prayers coming! They're working. Who Can Resist a Little Boy in Glasses? Last night we went out to dinner at the Old Country Buffet with a couple from church. We were amazed at how many people took note of Elijah. 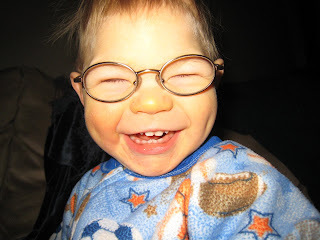 He was in a great mood, playing, smiling, laughing and - wearing his little glasses. I’m not over exaggerating when I say at least four people stopped at our table to tell us how adorable Elijah is. That’s not counting the people who stare and smile without saying anything. It seriously felt like he was a celebrity. 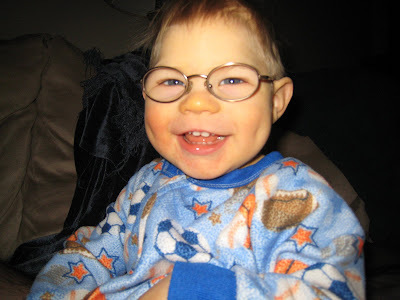 Elijah was only eight months old when we got his glasses. Most people aren’t used to seeing a baby in glasses, so people would literally point at us. I’ll never forget walking by a lady once and although she didn’t say anything (and had the decency not to point!) I knew exactly what she was thinking from the way she tilted her head and the expression on her face…Oh, a baby in glasses, how cute! Some people (usually teenagers, it seems) are a little more obvious. They’d stop, point, and say to their friends (loud enough for me to hear) “Look! A baby in glasses!” and they’d all smile with glee at the spectacle that is Elijah. I thought since he is getting older people weren’t noticing our little guy in glasses as much. But within moments of sitting down last night at OCB, Elijah was getting that same treatment. A family was gathering at the door to leave and I saw them pointing and smiling at Elijah. It seriously took them longer to leave the restaurant because they all had to stop and stare at our little guy (and these pointing people were adults!). It’s kind of a strange sensation to have people point at your kid. Not that I am complaining, as I know it is done in a positive manner. No one is making fun of him (which would be another story); they simply think he is cute. It’s cool to have people take note of what we already know – Elijah is one amazing little guy. Last night, I sat at OCB thinking that I was glad people can experience a slice of the joy we receive from being around Elijah. He really is adorable and who can resist a little boy in glasses? Can you? How did our little guy get to be so big? 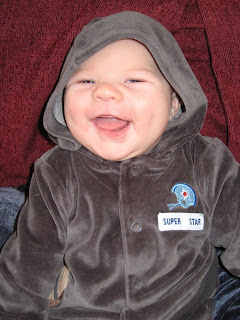 Tonight Elijah is seventeen months old and I find myself wondering… Where oh where has our baby gone? I look at him and think about how long he is - or rather - how tall he is. He’s looking less and less like a baby and more and more like a little boy. In some ways, I miss the baby in him, but only for a millisecond. Mostly I’m cherishing having an awesome toddler in our house, even if it’s hard for me to wrap my mind around the fact that our baby isn’t a baby anymore. He’s a little man – and we love it! Elijah never ceases to amaze us. Tonight, Elijah conquered another milestone. This time, both Andy and I were able to witness it and we looked at each other with wonder. “Isn’t this amazing?” Andy said, with a twinkle in his eye. I nodded. So, what did the boy of wonder do? He pulled himself to stand! Tonight Andy and I stood at the edge of Elijah’s crib and watched as he reached up, grabbed the crib with both hands, held on and pulled himself into a standing position. Of course, there was clapping and praise as we watched our amazing boy. I can’t explain how exciting it is. Since his arms have been the part of his body that has been the slowest to develop, it’s phenomenal that he is able to do something that requires so much proficiency with his hands. Today, for the first time, I came out of the bathroom and I didn’t know where Elijah was. He wasn’t right outside of the door where I had left him and he wasn’t in the kitchen where I thought he might be. Oh, he must be in the living room. Nope. In the dining room? Nope. At this point, I’m starting to feel a slight bit panicky, which is somewhat irrational. I mean, there aren’t very many places he could be, our house isn’t that big, and the rooms are mostly baby-proof (as far as I can tell). I start to think, is he under the table? No. I walk a little further and it turns out he was in the kitchen all along; he was just out of my sight when I looked the first time. The wonderful thing is that Elijah is exploring and isn’t content to stay in one place. Looking for Elijah is an awesome place to be. Seriously, did he really do that? Elijah is so determined to walk; so much so that he doesn’t like to be set on the floor. When you set him down and he’s in the mood to walk, he fusses and cries. He won’t crawl; he just bounces on the floor and complains. It’s frustrating for both of us; I can’t walk him around all of the time and he’s frustrated that he can’t do it on his own. (I take the frustration as a good sign of his cognitive abilities, but that’s a whole other story…). This past Friday night, he really caught me off guard. We were unpacking our van from a visit to Elijah’s grandparents. We set Elijah on the floor so that Andy and I could unpack. Elijah was not happy. He wanted us to walk him around the house and was so angry that we were not complying. And then, I watched in amazement as he pushed up onto his feet and arms (I think it’s called the downward dog in yoga). 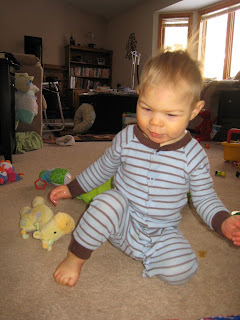 He then proceeded to “walk” on his hands and got himself into a standing position – completely on his own! He took a few steps forward – on his own! – where I proceeded to grab him because he was about to crash into something and because I was in utter shock that the little guy had just managed to stand up and walk all by himself. Of course, Andy was unloading the van and didn’t see it. “Um, Andy,” I said when he came inside, “Elijah just stood up and walked by himself.” Andy looked at me like I was crazy. “No…” he said in disbelief although he knows that I would never lie about such a thing. Elijah hasn’t done it since, although not for lack of trying. He really, really wants to walk. Each and every day he is literally a step closer to walking. How amazing is that? A few weeks ago our School OT and PT encouraged us to teach Elijah to crawl over the step in our sunken family room. I hadn’t worked on it too much with him. I tried, but he wanted to walk over the step as we’d already taught him how to do that. And then last night, he did it! Andy noticed that Elijah was trying to get over the step and so both of us helped him get to the other side. And then Elijah got it. Now he crawls over that step with ease like it’s no big deal. Tonight, when Andy got home from work, Elijah got himself out of the family room and crawled to the door to greet his dad. I got all teary-eyed. What a feat that was! Now he’s on his way to becoming a mountain climber. In my mind, he has already climbed Everest.